It’s looking to be pretty crazy around here the next few days, what with Christmas and presents and baking. We’re also going down to Toronto for a couple of days to meet my new one-week-old nephew, SMan, and I can’t wait to rub my nose in all that baby smell. Mmmm! We’re wrapping up the advent calendar activities too, and as things get busier I get worse and worse at remembering to take photos. So this will be a pretty quick wrap up of the month’s events! Last Friday we were going to make crowns and have a parade, but I ran out of steam, so the night before I swapped it out for “read books with Mommy.” I had a couple of Scholastic books I was saving for the holidays so we read those together, and then the kids ran and picked book after book and that kept us all busy for quite a while. I’d actually do this one again; it was such a nice peaceful way to spend the afternoon. Saturday we had our fancy dress-up dinner, which went very well, definitely a keeper. The Captain loves to wear a tie. Sunday we went to family skate. We were really worried about this one. Gal Smiley and Captain JB took a skating class through the city last year but they never got really comfortable on the ice. They were able to kind of waddle about with minimal falling but that was about it. Still, we had skates for everyone that were going unused, and we even had bob skates for the Little Miss, so it seemed a shame not to at least try. In any case, this turned out to be a great event. The Captain in particular was really excited to be back on the ice and he worked really hard. Gal Smiley and the Little Miss did a few circles and then they were done, but they were happy to sit and eat graham crackers with Sir Monkeypants, and everyone loved the zamboni break. So overall, it was a great afternoon and I had a lot of fun, and I’ll definitely be taking the Captain, at least, for more skating this winter. 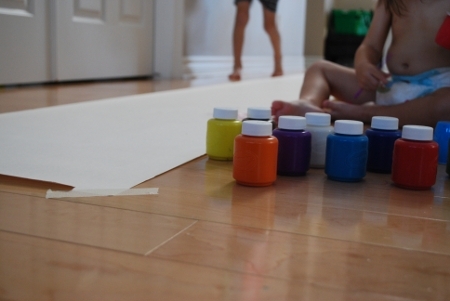 Monday we rolled out a huge piece of paper down the hallway, and went to town with paints. It’s imperative that everyone strip down to as little as possible for this activity, since you know that it’s only a matter of time before they use their own bodies as canvas. 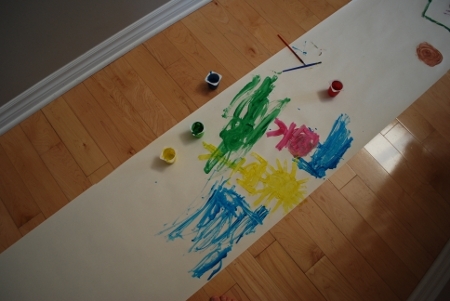 The kids had fun painting pictures, and then they painted their hands and feet and made body prints all over. Then everyone had to get in the tub as there was paint EVERYWHERE. Still, good times. Yesterday we used the Captain’s old Thomas toys to build a train track all around the tree, which was fun and everyone joined in which is always good. Today we’re going to go for a drive after dinner in our PJs to look at Christmas lights. The kids are kind of “whatever” about the lights but going outside in their jammies is SUPER EXCITING so they’re pumped. 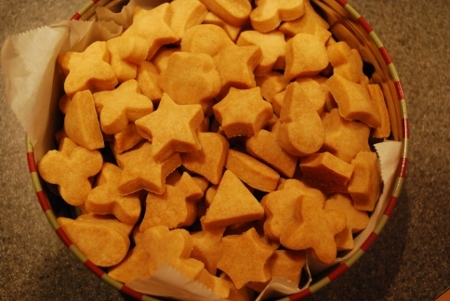 The shortbread is so cute! Totally coveting the wee little cookie cutter shapes. The Advent activities sound like lots of fun, especially the painting. Reminds me that our kids have been asking for ages for me to pull out their paints, but we’ve been so busy. Maybe I’ll make it an activity for tomorrow. Have a wonderful Christmas! Enjoy those new baby smells. Hope the roads are good for driving. Cheers.